I’ve learned that to make my rooms feel complete and pulled together, I need to add layers. I can’t just place the furniture, hang a little artwork on the wall and call it done. I need to go a few steps further. Such was the case on our diy planked wall in the dining room. The vintage mantel shelf and the buffet are all well and good, but they weren’t enough to properly fill the wall. The wall measures about 15′ wide, not counting the bay window, so I had these two rather large blank areas on either side of the buffet. I felt like a couple of hanging lanterns, to flank the shelf and buffet, would be just the thing. 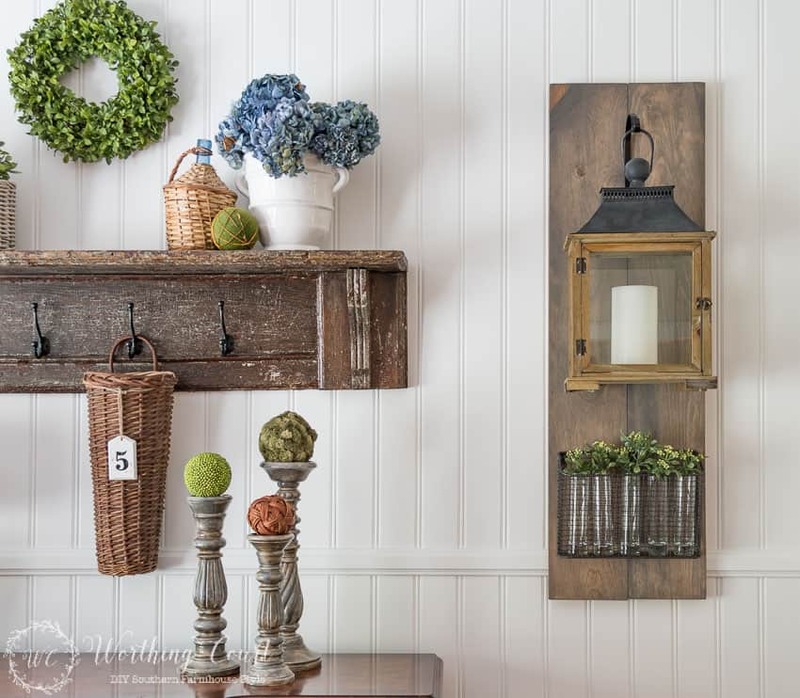 But lanterns hanging by themselves would have been too dinky, sooo…after picking up a couple of lanterns at At Home, I channeled my inner Joanna Gaines and made large wood plaques to hang them from, along with a wire basket filled with glass vases and little sprigs of greenery. UPDATE: CLICK HERE TO LEARN HOW TO MAKE YOUR OWN HANGING LANTERN DISPLAYS! BTW – At Home is pretty much my go-to place when I’m specifically looking for lanterns. No, they aren’t paying me to say this. I just think that they always have a good selection and their prices are very reasonable and I want you to know about it! I placed a battery operated candle with a timer (also from At Home) in each lantern. The candles won’t give off a ton of light, but their glow will add a nice ambiance to the dining room at night. And I think the wire baskets will be fun to change out seasonally. I can think of all sorts of items to fill them with. I think that I just might be ready to call this side of the dining room makeover complete! I’ll share exactly how I made the plaques in a couple of days, in case you’d like to try this project yourself. Don’t worry – they’re easy and budget friendly – just like the rest of my projects are. UPDATE: Click HERE for a step-by-step tutorial for how to make these for your own home! They look fantastic. Such a clever idea. That wall is amazing! Anytime you would like to create another one, I have a wall that would love that treatment right here in central Florida! 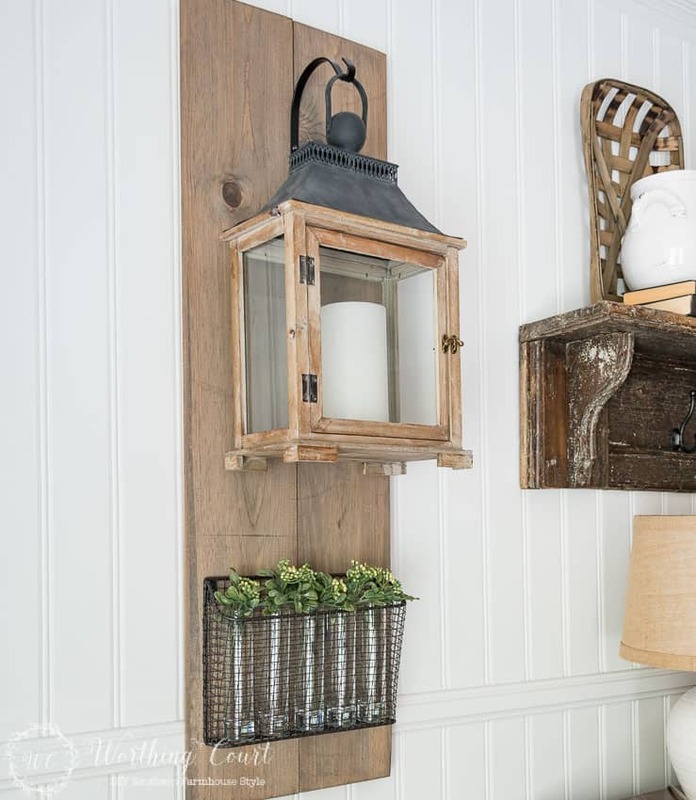 The hanging lantern and wire basket are a great addition! LOL, Chloe! I’ll be right on down! Love, love, love your hanging lanterns! Looks great, thanks for sharing on craft schooling Sunday! Thank you, Sara. Love your party! Great channelling of your inner JG! The lanterns themselves are wonderful but what you did to “add layers” looks fantastic! Thank you, Lori. I’m so glad you like them! Thank you, Linda! I’m glad to hear it – having too much on that wall was a big concern. The whole wall is simply gorgeous! What a beautiful wall display you have created and I LOVE the handing lanterns! 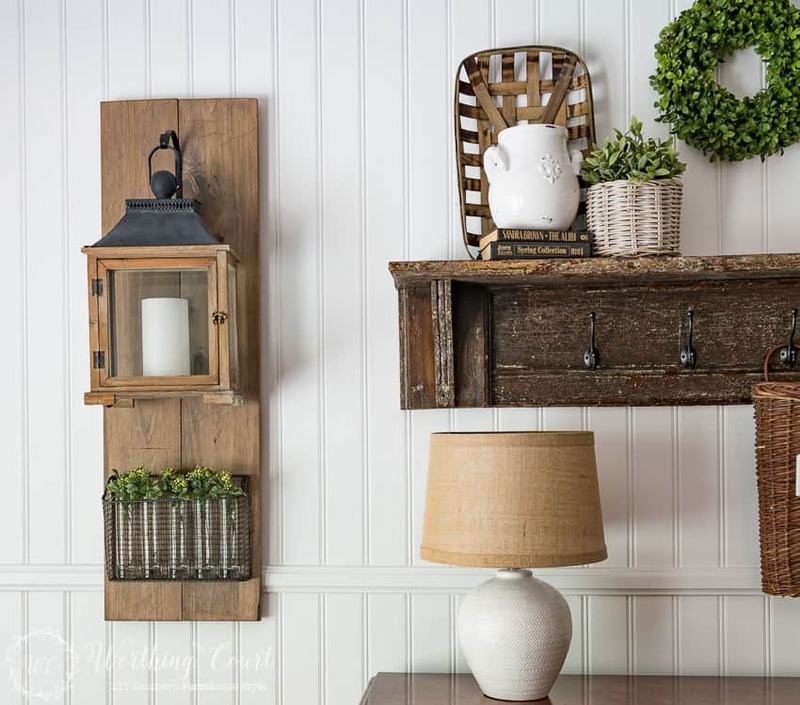 I also LOVE the shelf between the lanterns! 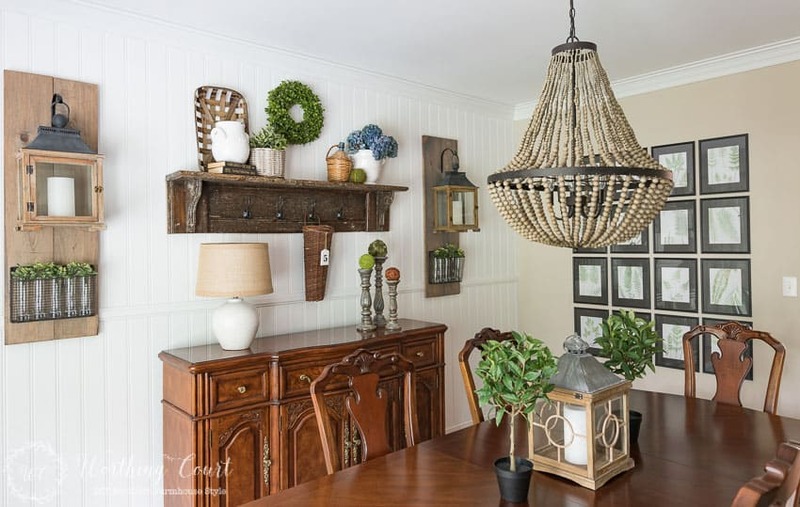 Is that an antique shelf or one you made look old? Another fabulous post! Thank you so much, Karen! The shelf between the lanterns is actually the top of an old mantel that I picked up at a salvage place for $10. It has layers and layers of chippy paint on it. It’s so old that I was concerned about it being lead based paint, so I sealed it with polyurethane before I used it. You obviously found something that worked because your home is beautiful!! Thanks fro sharing this idea at the Family Joy Linkup! 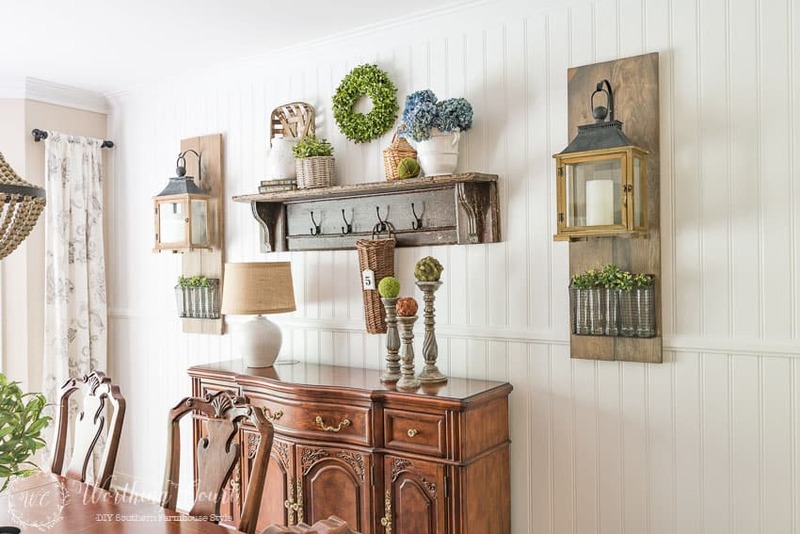 I never would have thought to do something like this and I love how these lanterns look on your wall! You did a beautiful job and I’m so glad you came to share it with us at Share The Wealth Sunday! Thank you, Lisa! Love sharing at your party! Love this project Suzy! Gonna try my hand at it. Thanks for posting! So glad you like it, Sherry. Have fun making your own! Thank you, Pamela. Give it a try – they’re easy and inexpensive to make! Thank you, Theresa and thank you for pinning and sharing! This is a stunning project! I want to make one for myself. We’d be honored to have you share this at our weekly link party. http://www.thelifeofjenniferdawn.com/2016/07/diy-painted-projects-for-home-and.html Hope to see you there! What a lovely wall display. The area looks so inviting! Thanks for sharing at Snickerdoodle Sunday. Pinning. Thank you, Beverly, and thank you for the pin! So glad you like the whole wall, Edye. Thank you! Your entire wall looks great! Thanks for sharing at Inspire Me Monday! Your post is featured today!! This is so lovely and gorgeous! pinning! I love your projects and especially like the directions you give us. The way you painted your dining room furniture is just what I need. I always felt guilty about wanting to use spray paint but you changed my mind about that! Thanks! Also, planning to use your idea for the curtains in the family room. How unique! Love your combination of styles. What a creative idea! I love the whole vignette! I love your collection of lanterns! Rustic, yet at the same time elegant. I love your lantern! And the extra touch of the wire baskets with the foliage at the bottom makes them perfect! My husband gave me a huge lantern with a flameless candle in it that’s also a heater ?! I ordered a huge rustic hook and am going to hang it in a corner. It’s really too big to sit on a table but kind of looks silly sitting on the floor. Your whole room looks fantastic! I followed your design idea for the wall lanterns. They turned out beautifully and I had alt of fun making them.